A few lovely things which are very much worth to figure on my list. 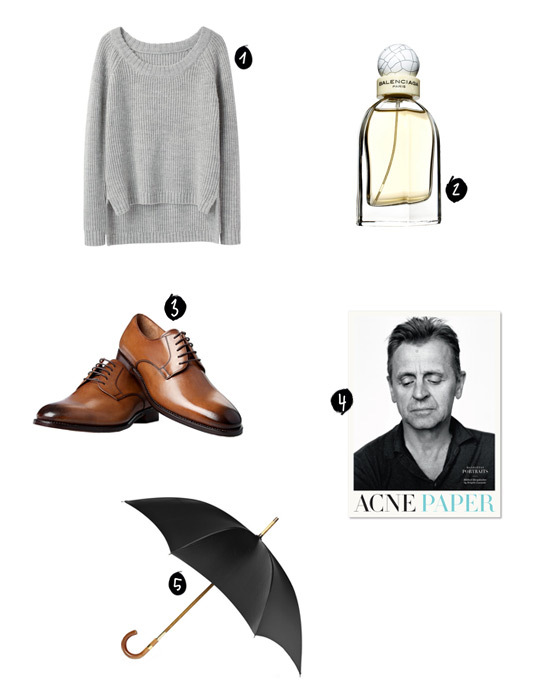 A grey sweater that has the potential to be the perfect one (I like both the neckline and the dropped back hem). A slightly heavier scent which is not only „wanted“, but very much beloved. A pair of handcrafted men’s shoes which is by the way just one among many others I would consider buying as a present (I do not dare to speak of Christmas yet, at least not officialy). The 14th issue of the Acne Paper which will be the perfect read this week. And a black umbrella which reminded me that some classics are never getting old. Great selection. Love that Rag & Bone sweater. I also like this selection! love the men shoes too. I was thinking to buy a pair in black for myself, ha!. I hope you also have a pleasant week so far Marzena!